Hey PaleOMG, friends! 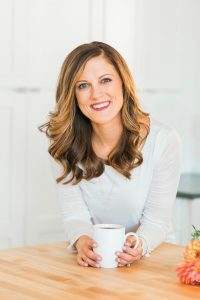 It’s Stacie here, dietitian and co-founder of The Real Food Dietitians! 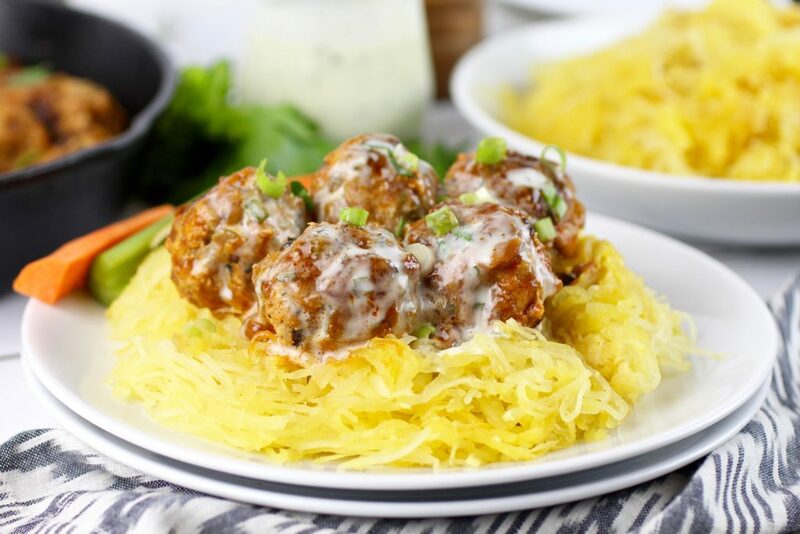 You may have remembered me from when I shared my easy-and-tasty Buffalo Chicken Meatballs last August as well as a bit about my journey to real food and the paleo lifestyle – yup, I used to be a calorie-counting queen and low-fat dieter. 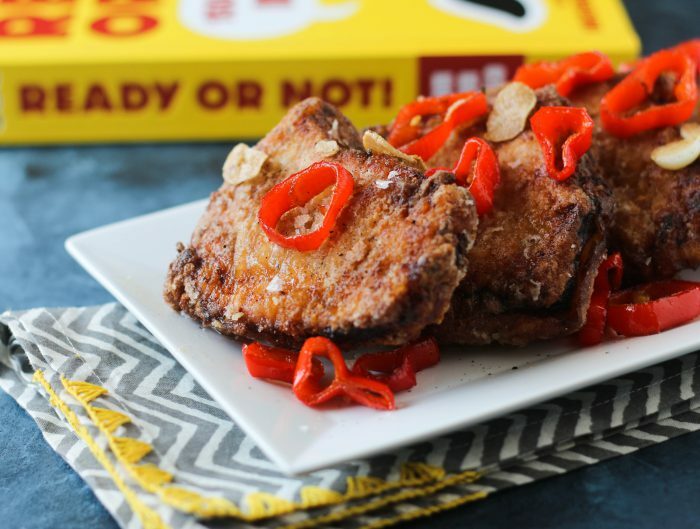 Today, I’m back on PaleOMG and I couldn’t be more excited to share another crazy delicious recipe with you! You’re going to love this one. A big thanks to Juli for providing me with this awesome space to share my love for Real Food and tasty recipes. It’s such an honor! A quick side note: My business partner, Jess and I, met up with Juli for lunch in Boulder, CO, at an amazing gluten-free restaurant called Shine a few months back, and if you haven’t met Juli in person, I want you to know that she’s just as incredible and hilarious of a person offline, as she is online. She genuinely cares about the paleo community and her readers…you! We had such a good time chatting all things blogging and devouring the best curry ever. Alright, so who likes simple recipes?! I sure do! I’m all about super simple and delicious recipes because I just don’t have time to spend hours upon hours in the kitchen cooking, eating and then doing dishes. My guess is that you don’t either. It seems like we all have hectic schedules, whether we’re a parent, a student, an entrepreneur etc. It’s just the way of the world these days and as much as I try to ‘slow down,’ it just doesn’t happen. I’m a hustler by nature, I’ve accepted that, so I just roll with it and do my best to listen to my body and give it rest when needed. With that said, one-pan meals have become a go-to of mine. 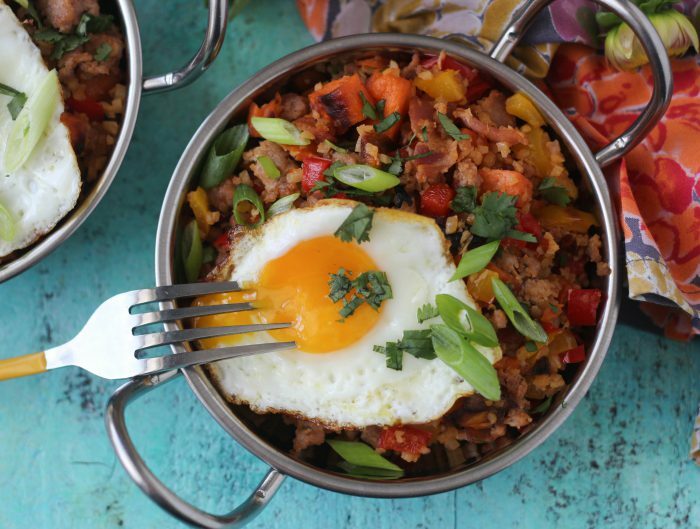 I love that it’s everything you need all in one pan – proteins, healthy fats, and complex carbs from veggies. 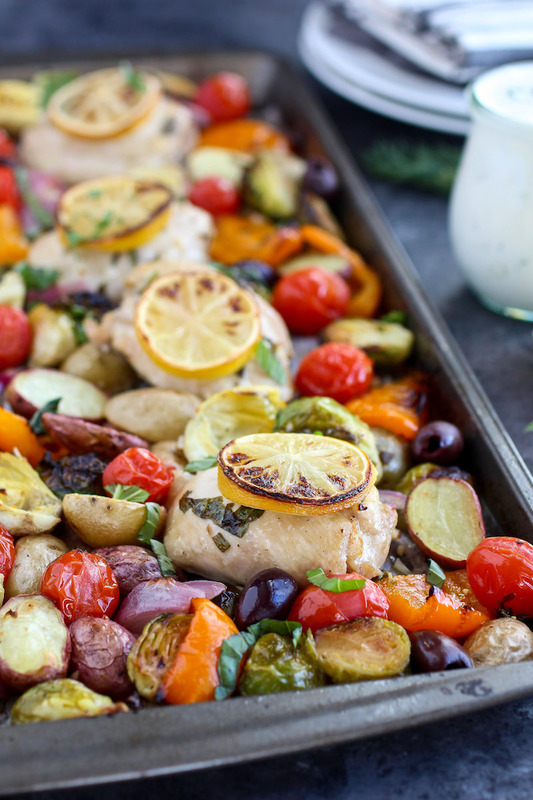 Recently, I shared a One-Pan Balsamic Chicken and Veggie Bake on my blog which inspired me to keep the theme going and share my One-Pan Greek Chicken & Veggies with Paleo Tzatziki Sauce with you! 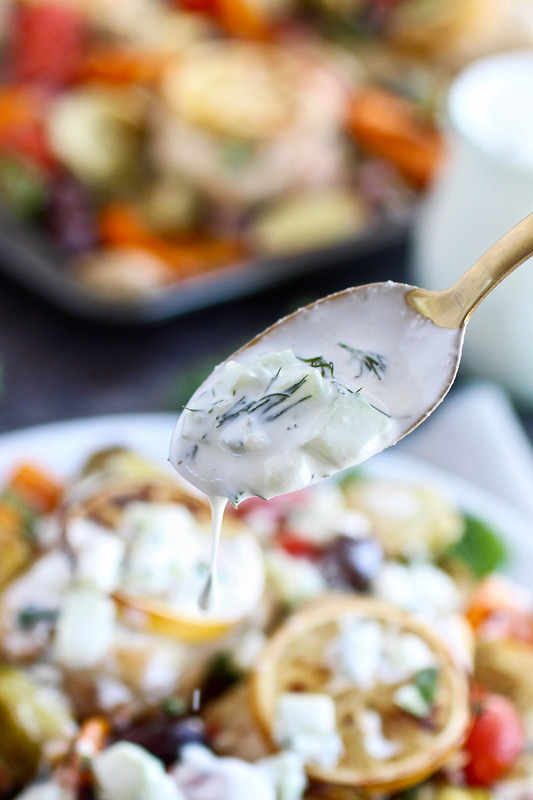 This recipe is prepared and baked all in one pan, super easy, full of flavor and the Paleo Tzatziki Sauce is to die for. 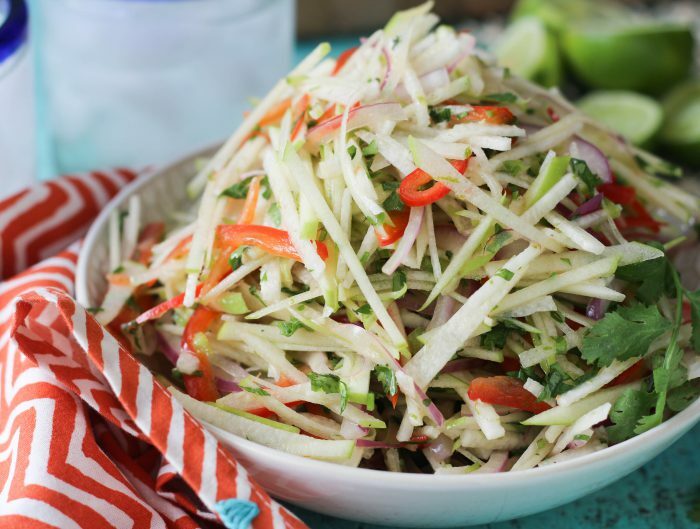 If you’re a fast veggie chopper or purchase pre-cut veggies, the entire recipe can be made in 30 minutes with 10 minutes of prep time and 20 minutes of oven time. While the chicken and veggies are in the oven, you can use that time to whip up the Paleo Tzatziki Sauce. I created this recipe to be completely dairy-free, but if you tolerate dairy, I’d suggest adding ¼-½ cup feta cheese right after it comes out of the oven. Because melted ooey-gooey feta…yes, please! The key to one-pan recipes is to find a combination of ingredients that not only taste delicious, but also have similar cooking times. You want all of the pan contents to come out of the oven at the same time, cooked to perfection. 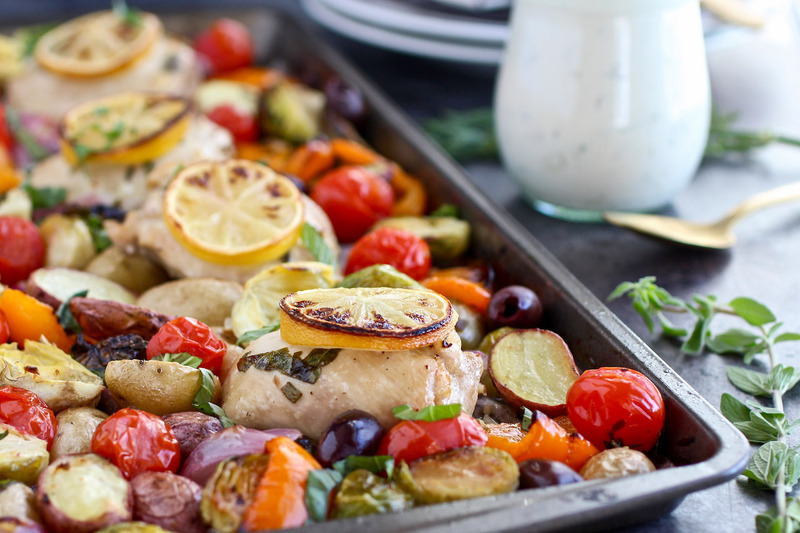 So I encourage you to read and follow the directions carefully to make that happen with this One-Pan Greek Chicken & Veggies with Paleo Tzatziki Sauce recipe. Combine oil, lemon juice, garlic, herbs, salt and pepper. Whisk and set aside. Place Brussels sprouts, potatoes, peppers, onions, artichoke hearts on the sheet pan. Pour ⅔ of the vinaigrette over veggies and toss veggies to coat. Make sure all pieces are coated. Move veggies around to make spaces for the chicken thighs. Place chicken on the pan. Top each chicken thigh with the remaining vinaigrette, then top chicken with lemon slices. Transfer pan to the oven and bake for 15 minutes. 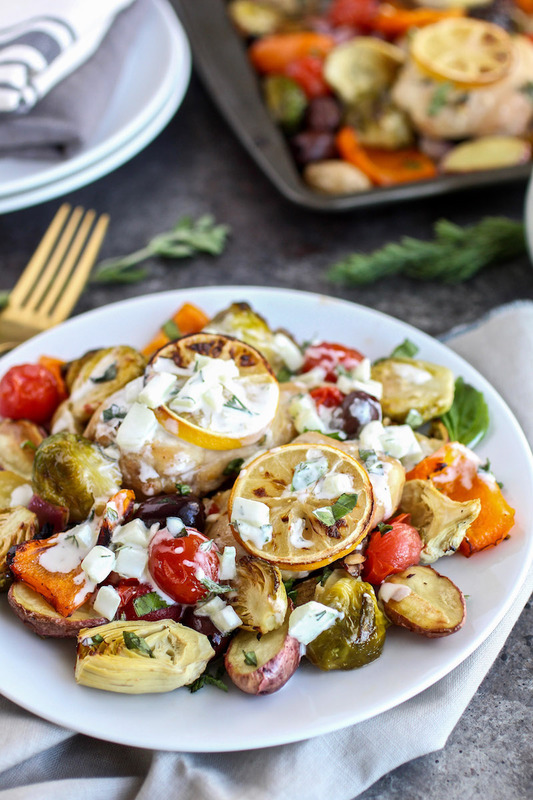 After 15 minutes, remove from oven and add tomatoes, kalamata olives and toss veggies. Place back into the oven. Bake for an additional 5-7 minutes or until chicken is cooked through. The time will depend on the thickness of the chicken. To ensure chicken is done, you could also use a meat thermometer. Once thermometer reaches 165ºF, remove pan from the oven. OR to crisp veggies up slightly, turn oven to broil and broil for 1 minute before removing from oven. Watch closely. 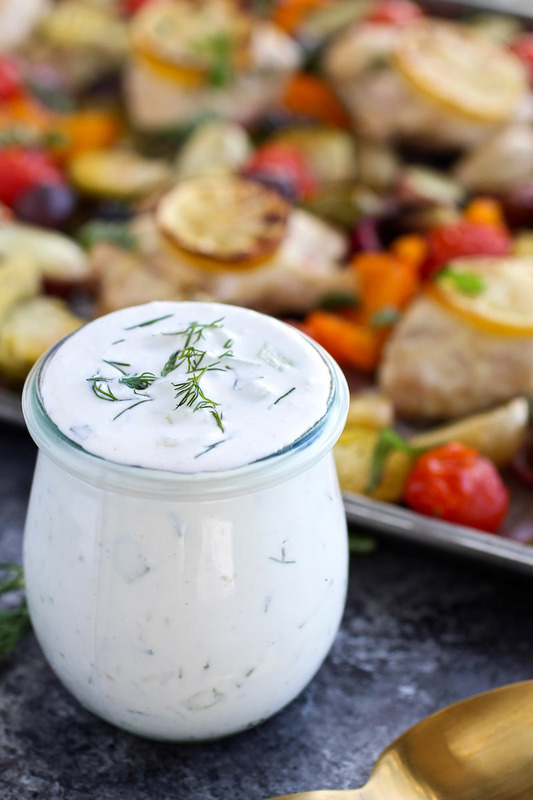 While chicken and veggies are in the oven, make the Paleo Tzatziki Sauce. This is optional but highly recommended! Top with Paleo Tzatziki Sauce and fresh herbs. Serve and enjoy! This rec looks great. Is 20 min total really enough time for baby potatoes and other veggies to cook? Usually I roast veggies for a lot longer than that. Made this tonight. We had to cook the chicken an additional 10 minutes. Then we removed the chicken and covered with foil, bumped the temp up to 425 and let the rest of the veggies cook for an additional 30 minutes. We also made a tzatziki using Greek yogurt for more protein and less fat (we’re just GF- not paleo). Once everything was cooked through the recipe was tasty. Next time I’ll double the vinegrette for the veggies. With some small tweaks it’s a winner. I made this tonight and it has potential, but like other commenters suggested, 20 minutes at 400 is not long enough to properly roast Brussels sprouts or potatoes. I started the veggies first at 425 and added the chicken after about 5 minutes. I should have cooked the Brussels sprouts and potatoes at least 15 minutes before adding the chicken because after 30 minutes total at 425, the chicken was done and the other veggies were still way under-done. Made this tonight and oh boy is it ever good!! Easy, incredible flavour, simple clean up and the best part is that it’s healthy and naturally gluten free! The tzatziki added a whole new flavour profile to the mix and it was way better with it than without. I changed it slightly to cater to our family and their preferences- omitted the olives and bell peppers and added broccoli, zucchini, and crimini mushrooms. It was still perfect. I marinated my chicken for about 30 mins and then baked it for 15 before I added the veggies as it was frozen but it still turned out perfect and moist. 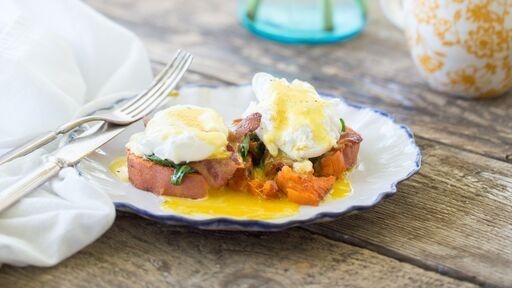 Major family win with this recipe! Won’t let me rate as a 5 star but for us it absolutely was. I had to cook this for close to an hour to get everything cooked, but once it was cooked, it was delicious! How well does it fare refrigerated for meal prep during the week? Or should it only be done fresh?